One reason kitchen remodels are so popular (they are perennially one of the top two most popular remodeling projects in the United States) is that they tend to deliver a lot of bang for the buck. A lot of that has to do with the fact that the kitchen is generally the focal point of the home. 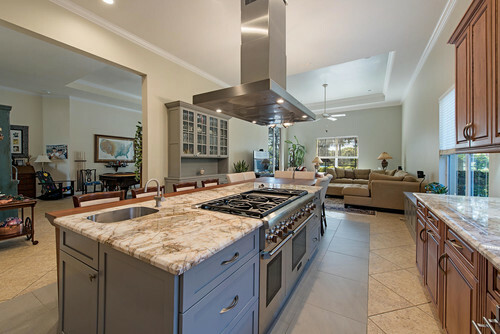 So how can you make sure your Naples kitchen remodel delivers the best results? 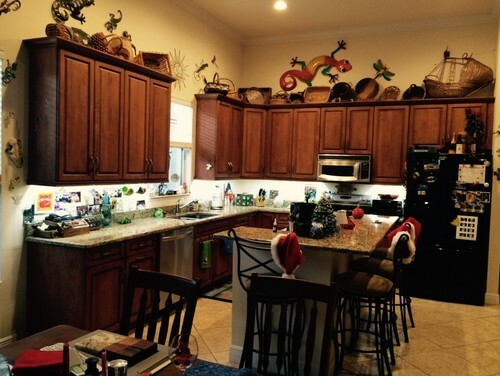 One reason to remodel your kitchen is to make your kitchen a more enjoyable place to prepare meals and to entertain. That doesn’t just happen because you change cabinets, install new appliances, or update your color scheme. Great kitchens are better by design. They start with a plan to make your kitchen function more comfortably and efficiently. Here’s a look at ways that a good design-build remodeler can help you avoid common kitchen frustrations with your Naples kitchen-remodeling project. Don’t get me wrong; it’s perfectly OK to “freshen up” your kitchen with a new look. But most of our clients want changes to their kitchens because their existing kitchen wasn’t meeting their needs. It could be that your family dynamics have changed and you need a kitchen that reflects that. Maybe you’re entertaining more and your existing kitchen isn’t really idea for that. The pictures you see here are a perfect example of that. You can read the story of how we re-designed and rebuilt this kitchen to better meet the family’s needs (and won an award in the process!). Here’s what the kitchen looked like before we got involved. Here’s how the kitchen ended up after remodeling. (Yeah, we think that in addition to being a lot more functional, it also looks a lot better!). Let’s be honest. Not everyone needs the same thing from a kitchen remodel. That’s why Reed Design Build offers a wide variety of options. Maybe you just need to have your cabinets resurfaced to restore that “like-new” look to your kitchen. That’s a legitimate remodeling project. You might want a contemporary kitchen remodel in which you turn an older galley-style kitchen into a sleekly beautiful contemporary kitchen. Perhaps you're in a condominium and want to redo your kitchen. Or you could want a full-blown upscale kitchen remodel in your single-family home. Those are all projects we do on a regular basis. Each one has its own scope—and price range. But what they have in common is that they deliver the results our clients want. For more information about those various types of projects, here’s a post that goes into more detail. Once again, it all comes down to delivering the results you want and need. We’re happy to meet with you to discuss exactly what you want and need from your Naples kitchen remodel. Our design team can work with you to create a design that will turn your kitchen wishes into reality. And because our craftsmen are part of the same team, nothing gets lost in translation. That’s just one of the benefits of working with a design-build remodeler on your Naples kitchen remodel. We can help you sort through the mountain of information you’ll need to process to get the kitchen results you need. We’re here to help!